VeloFuze Rear wheel Boost Hub Adapter Convert your 12mm x 142mm hub to fit 12mm x 148mm boost frames. Our Boost Hub Adapter allows you to run a 12mm thru axle rear hub/wheel with 142mm spacing to the new boost standard of 148mm frames. 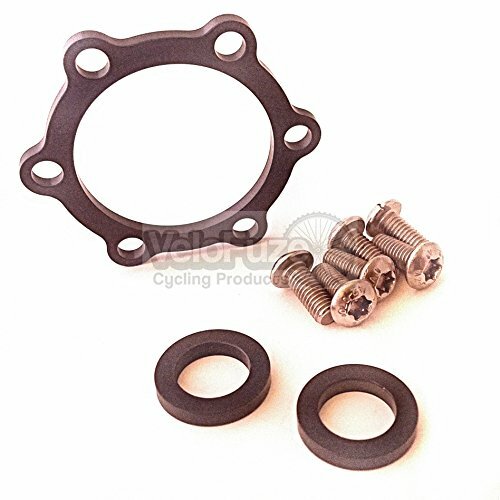 This Boost Hub Adapter Kit uses one 3mm Disc Brake Rotor Spacer along with two 3mm Hub/Skewer Spacers. This adapter kit will keep the wheel perfectly centered and no re-dish is required but the chainline may not be optimal as the cassette will be moved towards the center of the rear triangle 3mm. Included with this kit is one 3mm hub rotor adapter along with two - 3mm spacers that will be installed on each side of the hub. Our Boost hub adatpers are universal to fit most hubs and the most economical way to convert standard 142mm rear wheels to fit the new boost spacing standards. See our instruction videos or call us for installation help. VeloFuze makes 3 different boost hub adapters, one for the front and 2 for the rear. See our other items for those products.